A team of Russian and Japanese scientists recently announced that they have discovered pristine DNA samples of woolly mammoths, and they will clone a living mammoth within five years. It's tremendously exciting...but almost certainly not going to happen. Here's why. Honestly, cloning a mammoth isn't that much harder than any other species, assuming you've got the required materials. Of course, that's a pretty big assumption to make for a species that has been extinct for at least 4,500 years. Since our cloning technology is in place, all you really need is some pristine mammoth DNA. To get that, we have to find undamaged cell nuclei from a mammoth that we can insert into the egg cells of a surrogate parent, most likely its living relative the African elephant. That's why this recent discovery is potentially exciting. Global warming has thawed some parts of eastern Russia that ordinarily remain permanently frozen, and the newly uncovered ground has yielded a startling discovery: a bunch of well-preserved mammoth carcasses, including at least two calves that are well-preserved enough to donate cell nuclei from their bone marrow, at least according to a joint team of Russian and Japanese researchers. Now, to be perfectly honest, we can't even be really sure about that part of this story - considering how even the slightest imperfections could render the cloning process impossible, there's every chance that this bone marrow DNA will prove unsuitable for cloning. Still, let's just assume that the scientists at Japan's Kinki University can successfully extract the cell nuclei and place them in the wombs of African elephants. What then are the chances that we'll end up with a baby mammoth? Unfortunately, they're still not very good. At this point, it has less to do with the particular difficulties of cloning a species that's been extinct for millenniums - scientist overcame the main challenges of that part when they found the (presumably) pristine bone marrow - and more to do with how difficult it is to clone any species. Cloning remains a frustratingly inexact process, one where a single successful fertilization out of hundreds of failed attempts would be considered a massive achievement. Indeed, as recently as 2006, one review of cloning declared it a still entirely experimental technology, and that any successful attempt should be considered purely a matter of chance and luck. To illustrate this point, let's look at the only animal species ever brought back from extinction: the Pyrenean ibex. This goat species, once native to the Pyrenees on the border between France and Spain, died out in 2000 when its last surviving member, a female named Celia, was hit by a falling tree. Since the species went extinct only a decade ago, we have plenty of pristine tissue samples to work with, and so scientists immediately set to work trying to clone the species back into existence. The first attempt came in 2003, when cell nuclei were implanted into the eggs of goats. The scientists had been able to reconstruct a total of 285 embryos, 54 of which were ultimately transferred to a dozen goat surrogates. Of all these eggs, only two survived even the initial stages of gestation, and they too died just two months into the pregnancy. Six years later, a second attempt was made, with more successful results...relatively speaking. In 2009, the Pyrenean ibex officially went unextinct when a baby female was born alive to a goat surrogate. Sadly, the species went extinct again just seven minutes later, when the ibex died from lung defects. And yet, this baby, which wasn't healthy enough to survive even a half-hour, was still by far the healthiest clone we've yet produced from the species, surviving a pregnancy that dozens of other embryos could not, which in turn had all survived a fertilization process for which hundreds more cell nuclei had proven unsuitable. Those seven minutes of non-extinction were the end result of years of work and countless failures. In its way, it really is a towering achievement, but it's hardly encouraging news for those hoping to see an adult mammoth roam the Earth again. After all, this is a species whose extinction we were able to track and monitor, and as such take appropriate steps to maximize our supply of perfect tissue samples for the cloning process. We don't have that luxury with mammoths, and these bone marrow cells hardly represent an inexhaustible supply. Still, let's continue to be charitable here and assume that we can produce a cloned mammoth that survives infancy. What then? There's a lot of discussion about how the risk these mammoths pose to living species, and whether we would need to keep them contained in enclosures to avoid them upsetting existing ecosystems. And sure, those would be legitimate concerns. But I'm thinking of something a bit more fundamental here. Who, exactly, is going to care for the baby mammoth? Every other mammoth ever born (give or take the occasional orphan) had a mother and father around to teach it and show it its natural behaviors. While human caregivers might be able to keep these baby mammoths alive, we're talking about a species that no human has seen in thousands of years, so anything we think we know about its behaviors is ultimately just conjecture, and I wouldn't count on an African elephant "adopting" the mammoth as one of its own. Even if we can get a mammoth clone to survive, getting it to thrive is another matter entirely. Finally, we might as well look even further ahead and tackle the question of reproduction. Right now, it's not clear whether the bone marrow DNA is coming from males or females. If we're lucky, the two calves will be of different genders, giving us some small chance of creating a breeding couple. Of course, breeding an entire mammalian species from just two original parents is an extremely tall order, considering both the deleterious effects of sustained inbreeding and the fact that clones generally are less fit and healthy to begin with. And that's assuming we can get a male and a female out of this cloning process. If the donor nuclei all come from a single gender, then our options for keeping mammoths alive long-term are limited. Repeated cloning is maybe a possibility, but the integrity of the DNA is likely to break down over time. 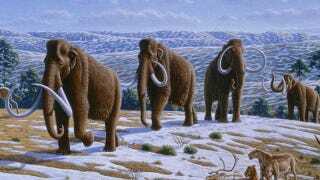 We could try crossbreeding the mammoth with elephants, but even if such a hybrid were viable this would still represent the end of actual woolly mammoths - and, at the risk of sounding species-ist, that rather seems to defeat the whole point. There's also some thought that we could tinker with the original DNA to swap the mammoth's gender, but that's likely to be even more error-prone and fraught with failure than simply cloning the unaltered DNA in the first place. So, let's recap. First, these bone marrow cells need to be absolutely pristine for cloning to work...and there's no guarantee of that. Next, we need to transplant those cells into African elephant eggs...and many of those will fail. Then, the embryos need to survive the pregnancy...and if 1 in 100 do that, it'd be a massive success. After that, the mammoth needs to be born and survive infancy...again, the odds are stacked against it. Finally, the mammoth clone needs to thrive in a world in which it is completely, absolutely alone...which is hardly a guarantee. And that's not even worrying about the question of this clone giving birth to more mammoths down the line. Taken all together, the odds that any of us will ever see an adult woolly mammoth with our current levels of cloning technology is probably somewhere between 1 in 10,000 and 1 in a million. And whatever, I'd say the five-year estimate is hugely optimistic - I'd be pleasantly surprised if a live birth of a mammoth happens in the next twenty years, even if it dies almost immediately. Yes, with this new discovery, we're closer to cloning a mammoth than ever before. The problem is, we're still a long, long, long way away, and in the absence of some major breakthrough in cloning technology, that's likely to remain the case for the foreseeable future.